Supporters of the opposition Movement for Democratic Change party (MDC) of Nelson Chamisa react as they block a street in Harare on Wednesday. There were high hopes that this week’s general election in Zimbabwe would unambiguously mark the end of this southern African nation’s long, painful slide towards totalitarianism and economic implosion under Robert Mugabe. But the violence-marred triumph of ZANU-PF, which has governed Zimbabwe since independence from Britain in 1980, dashes any such optimism. 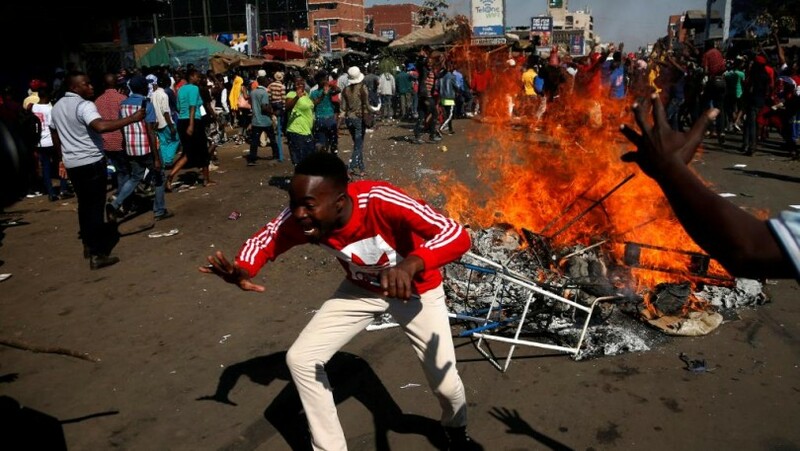 In the days since the July 30 election, officials delayed announcing the final results of the presidential race as each candidate claimed victory; police stormed the headquarters of the opposition and clashes between soldiers and protesters in the streets of Harare left at least six dead. When the parliamentary results were finalized on Wednesday, ZANU-PF had achieved a solid two-thirds majority in Parliament. The presidential cliff-hanger persisted through to shortly after midnight local time today, when the Zimbabwe Electoral Commission announced that incumbent President Emmerson Mnangagwa had defeated Nelson Chamisa by a tighter but still comfortable 50.8 percent to 44.3 percent margin. It was a sorry outcome given that the auguries for change were good. There had, after all, been a changing of the guard that exposed deep fissures within ZANU-PF. Last November, the nonagenarian Mugabe was deposed in a soft coup by the 75-year old Mnangagwa. Mnangagwa, somewhat implausibly for a man implicated in the worst excesses of the Mugabe regime, immediately promised his exultant citizenry a return to the rule of law and free and fair elections. Mnangagwa’s main rival, Chamisa, the leader of the Movement for Democratic Change (MDC) alliance, had charisma and age in his favor. In a country where 60 percent of the voters are below the age of 30, it was confidently expected that the 40-year-old Chamisa would do well. There were also international gains to be made. Zimbabwe’s leaders hoped an open election would bring an end to the Western sanctions and diplomatic isolation that were a response to the blatantly rigged elections in 2002, 2005 and 2008, combined with land seizures and human rights abuses. Mnangagwa’s ambitions to rejoin the Commonwealth and lure international investment capital to rebuild a shattered economy was clearly dependent on a credible election process. For the first time in 16 years, Western observers were invited to join the Southern African Development Community and the African Union to monitor the election. But instead of the prodigal bathing in a warm homecoming to the Western family of nations, Mnangagwa’s victory has struck a sour note. The MDC had claimed, within hours of the polls closing, that it had won by a wide margin. When the unflattering parliamentary results were announced — ZANU-PF’s two-thirds majority allows it to change the constitution at will — it accused ZANU-PF of stealing the election. The delay in releasing the presidential result fanned tensions, as Chamisa and Mnangagwa both claimed victory. There is reason to be skeptical about Chamisa’s claims. The MDC has, as yet, produced not an iota of evidence to back its allegations. And while it is likely that low-profile intimidation had some effect on the result, it is unlikely that the industrial-scale rigging that has characterized past Zimbabwean elections, could be achieved, unchallenged, under the eyes of hundreds of observers and thousands of opposition-party electoral agents. Nor will getting an electoral clean bill of health from, especially, the Western observer missions necessarily bring Mnangagwa the international finance and approval he wants so badly. While the European Union observer mission has indeed given him a qualified nod despite an “unlevel playing field,” Commonwealth monitors denounced the military’s “excessive use of force against unarmed civilians” during the post-election protests. The problems and delays plug into a deep national cynicism. An Afrobarometer pre-election poll found that 29 percent of voters did not believe their vote would be counted; 44 percent said the commission would release a false result; and 53 percent thought the security agencies would not accept an opposition victory. This kind of reconciliatory tone is a marked departure from the Mugabe era. It may even presage inclusion of the MDC, or at least the ambitious Chamisa, in some kind of unity government arrangement – although given the emphatic ZANU-PF majority, Mnangagwa may have a hard time selling such a deal to his party. Certainly, the narrower margin of victory for ZANU-PF in the presidential tussle must give the governing party food for thought. The ANC, which has governed South Africa since Mandela became president in 1994, faces its sixth general election next year. There are distinct parallels between the two countries and the two movements. 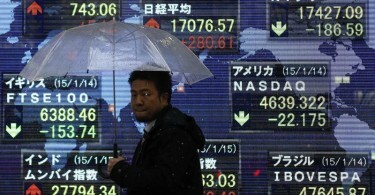 The South African economy, too, is under enormous pressure and corruption is rampant. South Africa, too, recently rid itself of a widely reviled president, with the ousting of Jacob Zuma earlier this year. His successor, President Cyril Ramaphosa, like Mnangagwa, promises to be a clean broom. Ramaphosa’s election was well received internationally. However, the turmoil in Zimbabwe must be resonating uncomfortably in Pretoria, where Ramaphosa is wading deeper into the politically-treacherous issue of land expropriation. Zimbabwe now acknowledges that the seizure of white farms was economically and politically disastrous and is promising reparations. Ramaphosa, by contrast, seems to have ignored that lesson in favor of pleasing his base. This week, he took the controversial step of announcing plans to change South Africa’s constitution without further ado, cutting short the public consultation process so that his government could begin its plans for expropriating land – still mostly owned by the white minority – without compensation. Like ZANU-PF, Ramaphosa’s ANC is likely to remain in power next year. But events in Zimbabwe show that an election win isn’t always a victory for the country’s people.